Austrian manufacturers Lewitt continue to plough their own furrow, with the latest in their innovative studio microphone range. Today's microphone market seems to be divided into four main sectors. There are the long-established companies still building the classic mics that made them famous (alongside their newer and often more affordable models); there are countless generic Chinese-built microphones right across the price range, most of which offer good value; there are bespoke companies building loving recreations of long-obsolete classics; and then there are those companies who are trying to push the technology in a new direction, without being tied to the limitations of the past and whose designs are original. It's probably safe to say that Austrian company Lewitt belong to that last category, and though they have their microphones assembled in China to keep their prices as keen as possible, the design work is all done in Austria, and the factory in China is actually owned by Lewitt. Lewitt claim that their LCT 550 cardioid-pattern microphone is currently the only large-diaphragm studio microphone to offer a 0dB (A-weighted) EIN figure for its electronics. This doesn't, of course, mean that the circuitry generates no noise whatsoever — just that it is extremely low, and even then the laws of physics dictate that, for a diaphragm of this size, random movement of the air molecules in still air will generate 3dB of noise — which in this case gives the microphone a 140dB (A-weighted) dynamic range and a signal-to-noise ratio of 91dB(A). The frequency response covers the 20Hz to 20kHz range with a sensitivity of 36mV/Pa. Standard 48V phantom power is required for operation. The capsule design, evolved from that of the LCT 540, features a gold-coated, centre-terminated diaphragm. Transformerless FET preamplifier circuitry contributes towards fast transient handling, and also means that the microphone isn't susceptible to electromagnetic interference, as transformer-coupled models can be. For stereo use we're assured that there's no need to buy a matched stereo pair, as each microphone is individually calibrated to ensure that any LCT 550 can be used with any other and still match to within extremely tight tolerances. 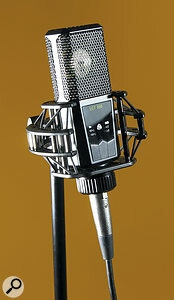 Physically, the mic is recognisably 'Lewitt', with its satin-black rectangular body and basket (158 x 52 x 36mm overall) and distinctive control panel. It comes in a compact, plastic (metal-reinforced) case complete with bespoke shockmount and foam windshield. Attenuation and filter settings are accessed via the three noiseless push buttons, and back-lit icons show the current settings. You can think of attenuation as being equivalent to a pad switch, though it works in a different way to most, by adjusting the capsule voltage to change its sensitivity. By way of controls, the mic offers a choice of 0dB, -6dB or -12dB attenuation settings allowing a maximum operating SPL of up to 155dB (A-weighted). Lewitt suggest that the mic is well suited to recording ambient sound, percussion instruments, acoustic instruments, vocals, choirs, and classical ensembles. As with some previous Lewitt models, the LCT 550 is also capable of storing clip information (clipping history), and it can even automatically switch itself to the next level of attenuator if the input gets too hot. There are also three low-cut filter options: either flat, 12dB/octave at 80Hz, or 6dB/octave at 160Hz. Other niceties include gold-plated XLR pins, a plastic carry case, and a two-year warranty. The filter settings can be cycled through by pressing the left push-button. Pressing it for more than two seconds also turns the Clipping History on or off. The idea is that if a clip has occurred since you last reset the Clipping History, the indicator flashes red and the pre-attenuation light also blinks to show the suggested attenuation setting needed to avoid further clipping. The right push-button selects the attenuation options in a similar way, but when held for more than two seconds it also toggles the automatic attenuation function on or off. When this is set to On the status icon shows in red and the attenuation is switched in or increased to the next level if a clip is detected. Clearly this will result in a 6dB drop in output level, but that will be easier to deal with at the editing stage than a clipped audio file! The middle button, when held down for more than two seconds, turns the key lock on or off to prevent accidental setting changes. Impressive though some of these advanced features are, it still all comes down to the way the microphone sounds. The documentation leads us to believe that Lewitt's aim here was to produce a quiet, accurate and detailed-sounding microphone, rather than one with an obvious character, so how does that stack up in our studio test? Those push-button controls, located on the live side of the mic where you can see them, are very easy to use, and the illuminated icons ensure that you make the right settings when working in poor light. Having automatic gain adjustment in the event of too much level is a novel feature that could save the day during a live recording, though having said that, things would need to get spectacularly loud indeed before it kicks in. In fact I couldn't produce any sound loud enough to register a clip even with all the attenuation switched out. It simply sneered at me when I popped some giant bubble wrap right next to the grille! Maybe you might need it if you're recording an album of jet engines through the ages, but for normal music recording I can't see you ever needing this feature. I queried this with the designers, who agreed that it was hard to make the mic clip, especially in a country with such tight gun laws as the UK! As the LCT 550 is being marketed predominantly as an instrument microphone, I tried it on the acoustic guitar first, where it achieved a natural and detailed sound right from the start, even before I started trying to find the optimum microphone position. As promised, the transient handling is excellent, but that isn't to say that the microphone sounds in any way clinical, as the highs sound smooth and there's also plenty of warmth down below too — and a noticeable absence of boominess. While the sound that comes over seems very natural, I couldn't put my hand on my heart and say that the mic isn't slightly flattering it in some way — but what I heard on playback was what I wanted to hear, so I guess that is more important. Vocals also come across in a very natural way, which is always a good sign as we are keenly attuned to the sound of the human voice, so any coloration becomes very obvious. Again, there is a sense of warmth balanced by detail, with no obvious 'hyping' taking place, which should make the LCT 550 forgiving of different vocal characters. I spoke around 400mm from the microphone to avoid the proximity effect causing a false impression. A further test using a set of small bells also confirmed that this mic is hard to trip up — the sound came back very clearly with no obvious intermodulation distortion. I have to conclude that the LCT 550 is a very capable all-rounder that delivers an honest yet musically satisfying sound in just about any recording situation you can imagine. It is extremely quiet, as the specifications imply, which means it can be used for demanding work where the sound sources are not necessarily very close to the microphone. I'm not sure that the advanced auto-attenuation feature is a necessity for most users, but it doesn't hurt to have it. While this microphone has a professional price tag it is still very reasonably priced given its fine performance. There's currently no shortage of good microphones at pretty much every price point, though I don't know of any others that offer the same clip logging and automatic attenuation features. Well-balanced sound with warm lows and smooth highs coupled with excellent transient detail. No specific cons, though I can't help thinking that most users will never need the auto-attenuate function. 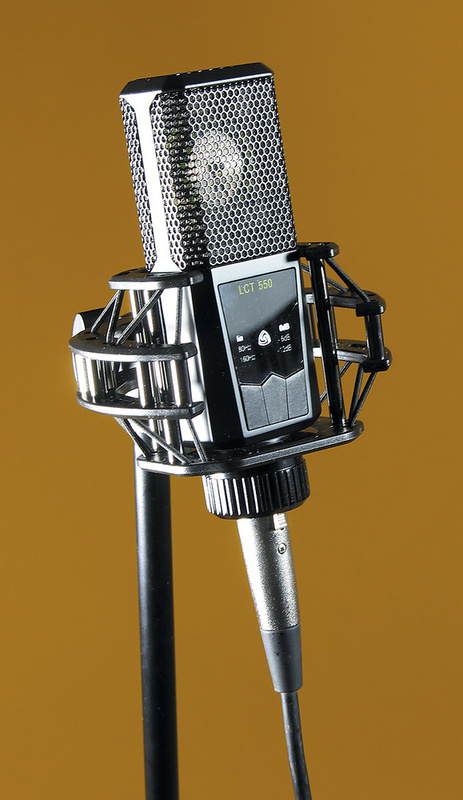 Priced towards the lower end of the professional microphone bracket, the LCT 550 is a versatile studio mic that can take on almost any task without flinching.